When we first start out, we feel *SO ALONE*. It's the “survival of the fittest” mindset that holds us back and really hinders us from true growth. Competition is trying to take the biggest slice of pie in this dog-eat-dog world.... Competition is thinking that there's not enough to go around, and pitting people against each other. Competition encourages selfish, closed-off values and often enough: hostility and animosity. 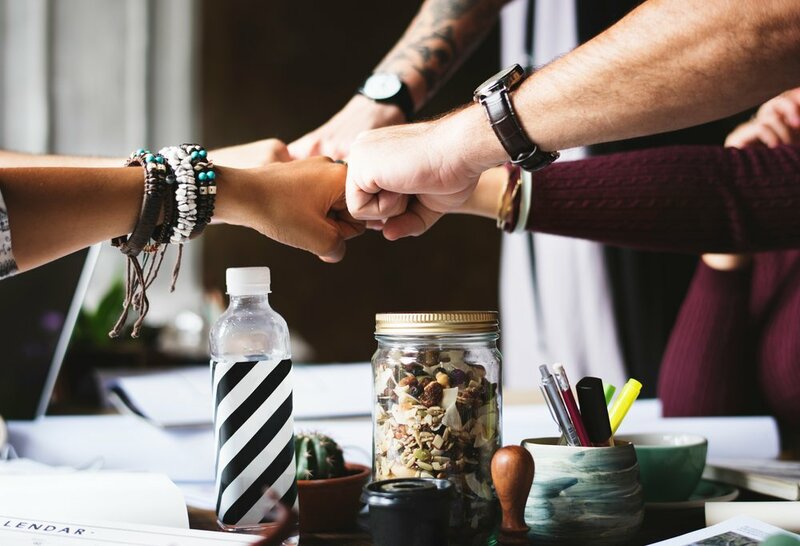 Collaboration is a “scratch my back and I will scratch yours” mindset – the more we collaborate together, the more we can raise awareness as a collective and has a compound effect on all parties. It's a synergistic exchange. Collaboration encourages more open-minded and selfless behaviors and leads to a much faster learning curve and growth by offering more value to clients. You might decide it’s too early to establish formal partnerships and so, despite being told to avoid the competition at all costs, grab a drink and talk about the big picture with some of your colleagues. Who's judging you, and what do you have to lose?! Collaboration starts with CONVERSATION and nurturing a dialogue with like minded individuals. Imagine how your business would dwindle if you continued to network with and sell to the same group over and over again. Know who you're jumping into bed with, get to know one another! Worse comes to worst, you realize you aren't a good fit to work together, and your curiosity has subsided. COLLABORATION CAN LEAD TO: better ways to do things, learn different techniques, discover new tools & ideas for performing services, learn new biz strategies, save you time & money, bring in new clients, provide amazing value & customer service, forming great alliances / referral partners, see things from a new perspective, and nurture your own strengths while working on your weaknesses. Be on the lookout for partners to work with, to share ideas, to cross-market products or services. Have an attitude of curiosity about that person / business. How can you stand out a little more? What can you learn from them? What do you LOVE about that person's methods? What do you love about their marketing? What What would you change to make it work for you if you were in their position? - Which business owners do you genuinely enjoy working with? - What local companies do you admire greatly? - Which people/ biz owners are you jealous of / inspired by? - Where do you shop when you support other local businesses? - Which other local business owners buy from you? - Which community events / festivals do your colleagues 7 clients hang out at? - Which blogs do you enjoy reading? - Who are your “frenemies” in the industry? - Which business has services that compliment your clients' wellness goals? - Which facebook groups do your ideal clients hang out online? WHAT CAN I DO WITH COLLABORATORS? For example: I own Vida Pura Spa in Baton Rouge, Louisiana. I reached out to a local business with a similar name, that was relevant and beneficial for my clients. We collaborated together and did a cross promotion via Facebook live for each other's specialty services. Check out the screenshots below on how many views their business got us on Facebook! Since when does helping other people reach their goals hold us back in our success? Go be a badass BOSS and help out your local colleagues, and allow them to help you in the process.